Private gated 4/3/3 home on conservation and lake. 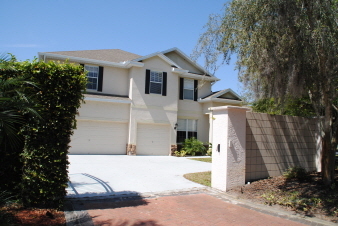 Private gated home on conservation and lake in The Preserve at Lake Thomas. Beautiful 4/3/3 home with screened pool overlooking lake is situated on a 1/4 acre lot! Gorgeous wood and tile flooring in the main areas and carpet in the bedrooms. Open floor plan with 2,993 sqft, lots of room for entertaining and relaxing! Spacious kitchen with island and wine fridge that holds up to 20 bottles! Large bedrooms, lots of upgrades, great natural light, lush landscaping! Large master suite with beautiful master bath. Screened pool has pool bath entrance and the maintenance is included in rent. Water softener and filtration system for the whole house. This home has its own private gate to the driveway! Referrals are the life of our business... please let me know if you have friends or family that would benefit from our experience!